Stiff northeasteries and waves are pounding Valencia, and sailing is on hold until the winter of 2010 calms down. Meanwhile, one degree of uncertainty has been removed from the prospects for America’s Cup 33, and it launched my morning with a laugh. Thus we find that media from the challenging country line up below Uruguay and above Uzbekistan. International marketing and event team already in place to support. The Société Nautique du Genève (SNG), trustee of the America’s Cup, has delegated the responsibility for organising the media and event activities for the 33rd America’s Cup to Consorcio Valencia 2007. The 33rd America’s Cup promises to be a regatta unlike everything which has been seen so far. The on-shore action will be concentrated at the Veles e Vents, the landmark building central to Port America’s Cup. A giant screen will be installed for fans and spectators to follow the races live as well as enjoying a host of complementary activities around the Port area. The International media centre with capacity for 150 journalists will be in close proximity to the Veles e Vents. To organize this event in a short time Gisbert has surrounded himself with an international team involved in the execution of the 32nd America’s Cup. This team led by Michel Hodara (SUI, 48) consists of seasoned professionals in the field of television, media, public entertainment and hospitality. Consorcio Valencia 2007 was in charge of the infrastructure of the 32nd America’s Cup What does it mean for Consorcio to be now in charge of the organisation for the 33rd America’s Cup? It’s a challenge. Thanks to our experience in the development of the Port we can give a fast and efficient answer to the technical requirements of an event like this. Also Michel Hodara and his team have joined to contribute with their experience. For three years we worked with him in the last edition of the Cup. The 32nd America’s Cup was a success. What can we expect from the 33rd? Another success, that’s the only way we can see it. This America’s Cup is a totally different proposition and now we are responsible for the organisation and we have a very limited amount of time. We are going to push our creativity and work capacity to the maximum. 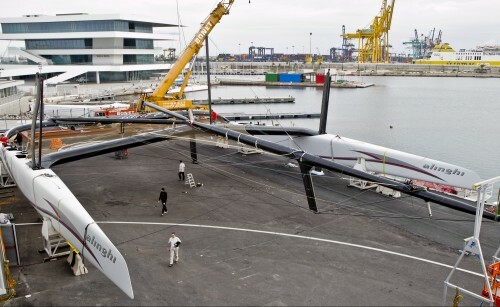 Valencia enjoys the legacy of the 32nd America’s Cup. What will be the legacy of the 33rd edition? We are seeing now that the work to produce the 32nd America’s Cup was the right effort. The 33rd America’s Cup will be an opportunity to show the world that not only can we can organise a great international event, but that we can do it in a very short period of time. What is it needed to organise an America’s Cup in such a short period of time? It is necessary to have a team of professionals that are used to work together and who are ready to do it 24 hours a day. In addition to the staff of Consorcio Valencia 2007 I have surrounded myself with people that enjoy aiming for the ‘impossible’. Will it be comparable to the 32nd America’s Cup? The 32nd America’s Cup was a five star event, developed over the course of three years. The 33rd America’s Cup is not simply the second chapter of that story, is a totally different story, it will be more compact, more intimate, but just as exciting. What will it be like as an experience, on the ground in Valencia? We will welcome fans with an inauguration event on February 7th. And from the first race, scheduled for the 8th, they will be able to watch the races live on a giant screen, get official merchandising and enjoy a range of activities for kids, youngsters and families. Also, there will be food and beverage points with Swiss, American and, of course, Spanish food. We want to create a special atmosphere a great fan experience.